it's been in my diary for months now, and after seeing singing to the sea by bethan huws, i'm very much looking forward to an afternoon among text, crosswords, installations and a bit of video. hehehe, and with such an announcement i am creating a bit of zugzwang* for myself to write about it afterwards. no, not the long overdue drawing assignment 1 but the final one of the three portfolios that so definitely have gotten in the way of markmaking exercises. it arrived safely with my for only a £9 surcharge on the plane and it's unwrapped and photographed (albeit the latter poorly). the forms are filled in and the particular form of german cv writing adhered to (i hope!). it's been a strange kind of process: sifting through, ordering and framing on a1 board 2+ years of artwork and thus objectifying it, framing it by a narrative of development while letting some (or many?) of the openings shine through. it made it a lot clearer for me what kind of development process a degree course in fine art is. and what it is not. i have been pondering the statement of 'having a too developed portfolio' and the context of a mature, though self-trained' style. it's stuff i've come across over the three years of reading and following other blogs while feeling my way along with my own and my own art practice. i'm glad that mine is framed at the moment by an a1 portfolio. feels fitting to where i am. i hope they'll see that in the same way. and now to more light and shade and the many gradations inbetween. 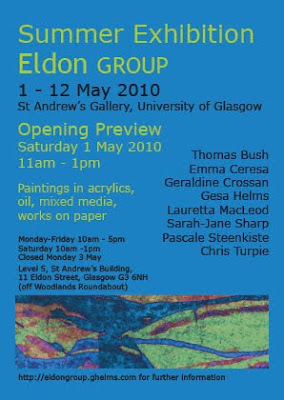 amidst all else, here's final a draft flier for the Eldon Group show 2010. 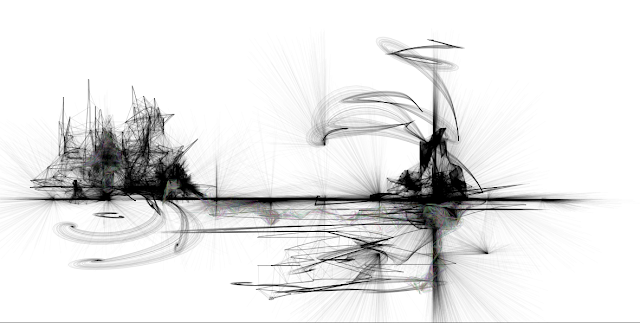 While the group composition is in a bit of flux and may change, the opening preview is set. St Andrew's Gallery, University of Glasgow. ...for the weekend. and after. ... is now. with a grin on my face i'm mounting this and that. pulling another folder out out of the depth of 'underneath my bed' or 'behind my wardrobe'. oh, yes... i should have another drawing of this. somewhere. (there have been plenty of 'portfolio days' over the past few months but now we're approaching physical handover day on friday). portfolio making is curating. in an a1 bookformat. as such it is intriguing: to observe the juxtaposition of disparate pieces in approach but in similar palette; to place next to each other sketchbook pages and a relief print from some time later as the latest development of a sketch. and to see and acknowledge the sheer amount of labour that has gone into this - visible and invisible - over the years. as well as the threads, lines of inquiry and departures across a variety of media and approaches. this one is one of the sheets. 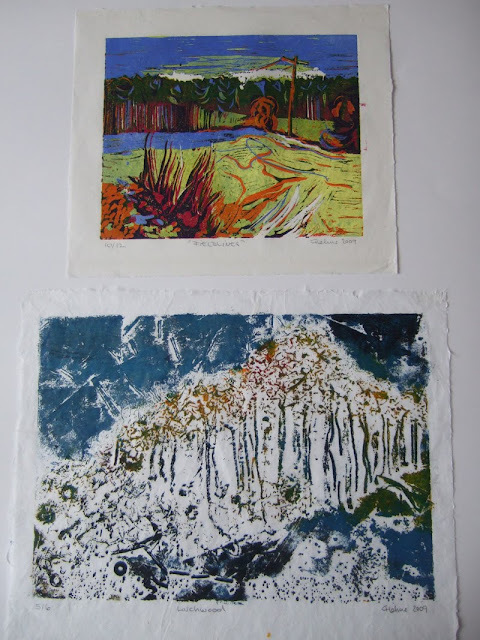 the collagraph at the bottom was the result of my printmaking before christmas. i still need to retry the transfer process, have indeed already sanded the plate down a bit further, and want to try on coloured paper. but placed beside the flattest of flat relief print it starts talking in unanticipated ways. keep it up, i think. i'll be listening. or should that be watching? most of my uses of photoshop are to do with precisely that: shopping photos and not all that much more. with perseverance i can produce a map, a layer mask or similar but that's all a far cry from using it as a drawing and painting tool. i have brushes on my iphone but find that if i fancy a sketch i rather take out the sketchbook than the phone. but with the harmony surface, and it's limited yet rather complex brush tools, drawing at the computer becomes something different: it's rendering, the shades and lines build up in interesting, and in some of the tools complex manner.